I have not posted much in this project recently, not because I have not been serving vegetarian items. I have been a bit busy and most of my vegetarian meals have been very simple and in all honesty, not very interesting. Stuff like bread and cheese or a simple salad have been making regular appearances, and I reserve my postings to more blog-worthy meals. So, why am I posting a picture of a sorry looking half eaten piece of bread with cheese and what looks like a mostly-drunk glass of beer? Because I think they actually are more interesting than they appear. See, the beer is a winter ale I brewed and after brewing it, I saved and froze portions of the ‘mash’. In very simplified terms, the ‘mash’ refers to the grains that were crushed and used to provide the flavor and sugar (for the yeast) for the beer. These crushed grains, what Peter Reinhart calls ‘spent grain’, comprise a part of the whole wheat grain bread you see in the picture. The recipe from the bread is from Peter Reinhart’s book ‘Whole Grain Breads‘. I highly recommend this book if you want to make delicious and healthy breads without using any white flour. 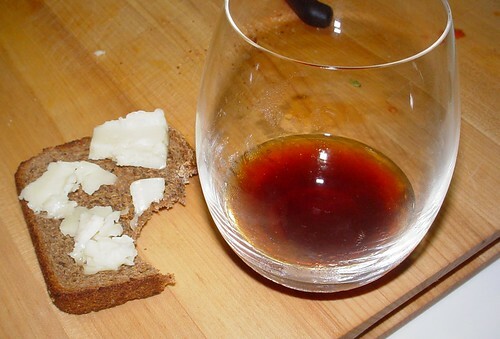 So, while enjoying a glass of my winter ale and a slice of my freshly baked bread with some cheese, it kind of dawned on me that this meal is a bit more interesting than it seems. Cool huh? I sure think so.